By Stephen Sherman, June, 2007. Updated March 21, 2012. On December 6, 1941, the day before the Japanese attacked Pearl Harbor, U.S. Navy Gunner's Mate First Class Victor H. Lively, stationed on the battleship USS Nevada, went ashore to Honolulu to buy Christmas gifts for his family ... gifts that were never to be placed in their hands. Shore leave lasted from noon to midnight. Procedure was to walk up the gangplank to the main gate, show the pass, and catch a taxi into town. He remembers paying about twenty-five cents to ride in a new DeSoto cab. Vic describes Honolulu as a "quaint town" where the tallest building was four stories high. The attack came early Sunday, December 7. Vic heard the alert, "Man the battle stations!" His post was in the foremast of Nevada where he served as director of operations for broadside guns. Broadside guns were designed to shoot horizontally at ships, not vertically at planes, so they were powerless in the attack that raged from above. "If I'd had a .22, I could have shot planes - that's how close they were," Vic remarks. The battle had been going for about an hour when, during a lull, he started to climb down from the observation tower. A bomb hit at the spot below him, killing everyone there. Had he started down a few seconds earlier, he would have been killed. 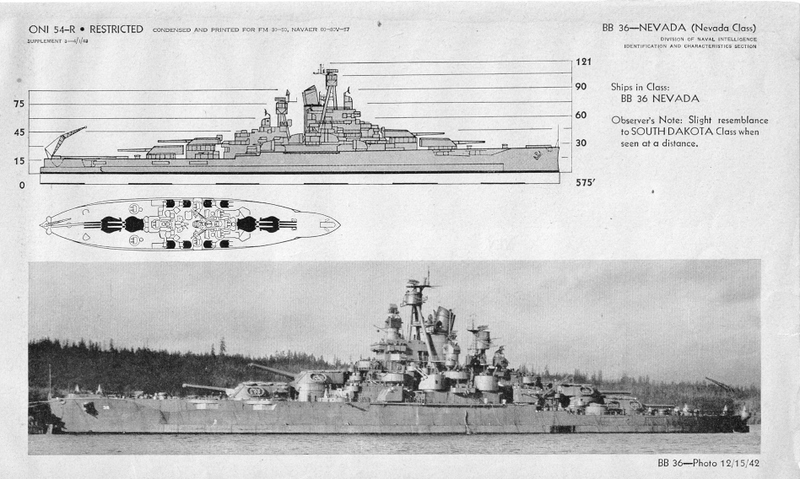 Battleship Nevada (BB–36), of 27,500 tons and 583 feet in length, dated to World War One. Carrying ten 14” guns, and twenty-one 5" guns, she was the only battleship to get under way during the attack on Pearl Harbor. The second Nevada (BB–36) was laid down 4 November 1912 by the Fore River Shipbuilding Co., Quincy, Mass. launched 11 July 1914; sponsored by Miss Eleanor Anne Seibert, niece of Governor Tasker L. Oddie of Nevada and descendant of Secretary of the Navy Benjamin Stoddert; and commissioned 11 March 1916, Capt. William S. Sims in command. Nevada joined the Atlantic Fleet at Newport 26 May 1916 and operated along the east coast and in the Caribbean until World War I. After training gunners out of Norfolk, she sailed 13 August 1918 to serve with the British Grand Fleet, arriving Bantry Bay, Ireland 23 August. She made a sweep through the North Sea and escorted transport George Washington, President Woodrow Wilson embarked, during the last day of her passage into Brest, France, before sailing, for home 14 December. Nevada served in both Atlantic and Pacific Fleets in the period between the wars. In September 1922 she represented the United States in Rio de Janeiro for the Centennial of Brazilian Independence. From July to September 1925, she participated in the U.S. Fleet’s goodwill cruise to Australia and New Zealand, which demonstrated to our friends down under, and to the Japanese, our ability to make a self-supported cruise to a distance equal to that to Japan. Modernized at Norfolk Naval Shipyard between August 1927 and January 1930, Nevada served in the Pacific Fleet for the next decade. 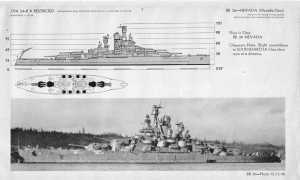 On 7 December 1941, Nevada was moored singly off Ford Island, and had a freedom of maneuver denied the, other 8 battleships present during the attack. As her gunners opened fire and her engineers got up steam, she was struck by one torpedo and two, possibly three, bombs from the Japanese attackers, but was able to get underway. While attempting to leave harbor she was struck again. Fearing she might sink in the channel, blocking it, she was beached at Hospital Point. Gutted forward, she lost 50 killed and 109 wounded. 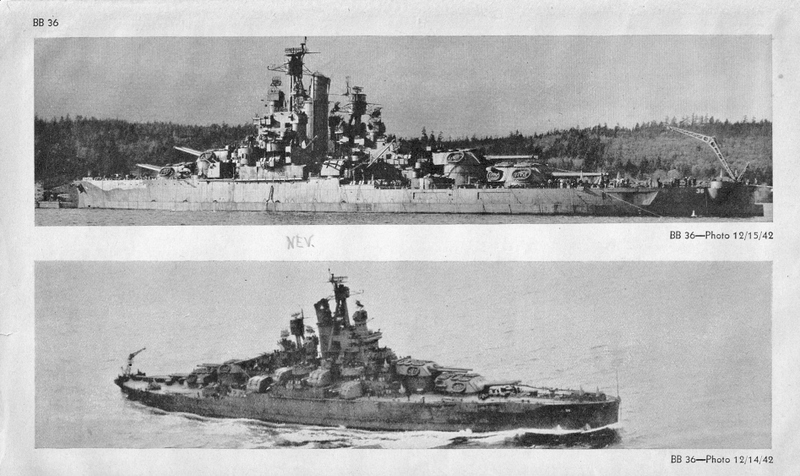 Refloated 12 February 1942, Nevada repaired at Pearl Harbor and Puget Sound Navy Yard, then sailed for Alaska where she provided fire support for the capture of Attu 11 to 18 May. In June she sailed for further modernization at Norfolk Navy Yard, and in April 1944 reached British waters to prepare for the Normandy Invasion. In action from 6 to 17 June, and again 25 June, her mighty guns pounded not only permanent shore defenses on the Cherbourg Peninsula, but ranged as far as 17 miles inland, breaking up German concentrations and counterattacks. Shore batteries straddled her 27 times, but failed to diminish her accurate fire. On 24 March, Nevada massed off Okinawa with the mightiest naval force ever seen in the Pacific, as pre-invasion bombardment began. She pounded Japanese airfields, shore defenses, supply dumps, and troop concentrations through the crucial operation, although 11 men were killed and a main battery turret damaged when she was struck by a suicide plane 27 March. Another 2 men were lost to fire from a shore battery 5 April. Serving off Okinawa until 30 June, from 10 July to 7 August she ranged with the 3rd Fleet which not only bombed the Japanese home islands, but came within range for Nevada’s guns during the closing days of the war. Returning to Pearl Harbor after a brief occupation duty in Tokyo Bay, Nevada was surveyed and assigned as a target ship for the Bikini atomic experiments. The tough old veteran survived the atom-bomb test of July 1946, returned to Pearl Harbor to decommission 29 August, and was sunk by gunfire and aerial torpedoes off Hawaii 31 July 1948. Read the rest of Vic Lively's story.